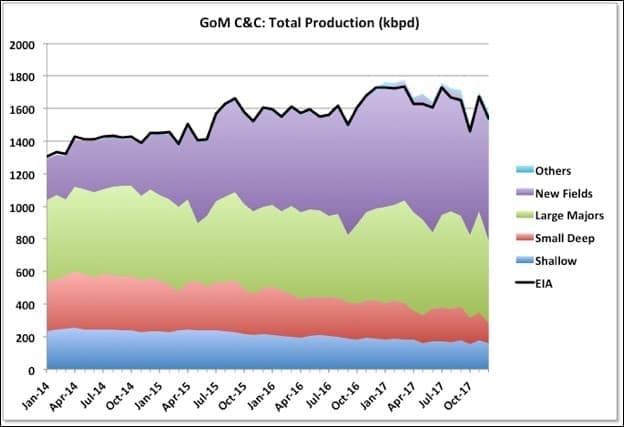 2017 was the highest producing year for oil in the GoM and included the record month in March. Gas, which has tended to come from shallow water wells, had accelerated decline. The production would have been higher but for some disruptions from Hurricanes, in particular Nate, though that had the least impact onshore, and some unplanned outages in November and December due to equipment failures. The failure to Delta House subsea manifold affected Rigel, Otis and Son of Bluto 2 fields, and the first two still appear to be off-line while Son of Bluto 2 resumed production in December (LLOG, the operator, I think calls the Rigel field Neidermeyer, which is much better for the Animal House theme). The Enchilada gas pipeline appears to have ruptured at the main platform and has resulted in Baldpate, Salsa, Llano, Cardamom and Magnolia going off-line. Plans were recently announced to restart Baldpate/Salsa, which do not go through the platform, but I haven’t seen any notice of the restart. December production numbers were dominated by the unplanned outages, so comparisons with November don’t mean much. As well as the two issues given above the Tahiti and Caesar/Tonga fields were off line for a few weeks, though I have seen no news why (these share a common set of leases but are produced separately to the Tahiti and Constitution platforms). Each month that these are three issues hold current outages would knock about 10 to 12 kbpd off the achievable average production for 2018. 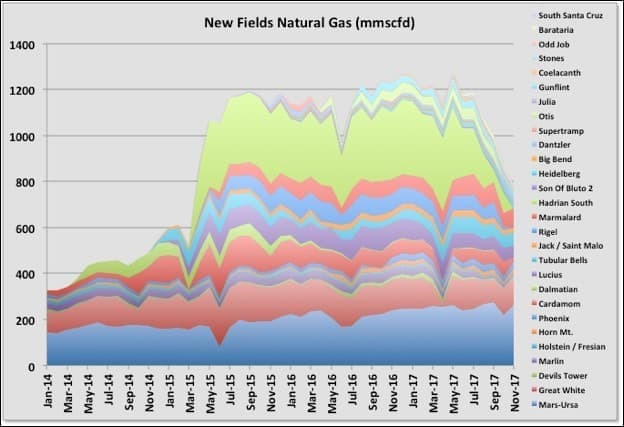 Despite recent variability it certainly looks like the new fields brought on since late 2013, and which have seen all the net growth since then, have peaked. 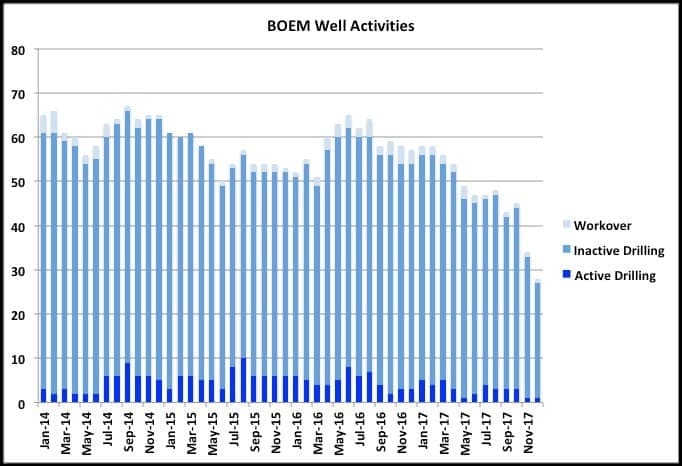 Any average decline rate can’t really be extrapolated yet, given the recent upsets, but the BOEM reserve estimate updates, due in the next couple of months, will provide better R/P numbers as there will be longer operating data for all the fields. BP, Shell, Anadarko, Chevron and BHP have completed a lot of brownfield work and in-fill drilling to maintain production at their large, operated platforms, but they may be running out of options for the next couple of years, and there is some evidence of rising water cut in some of the larger leases at Shenzi, Atlantis and Thunder Horse (and also in West Boreas, a recent start-up for Shell in Mars-Ursa). 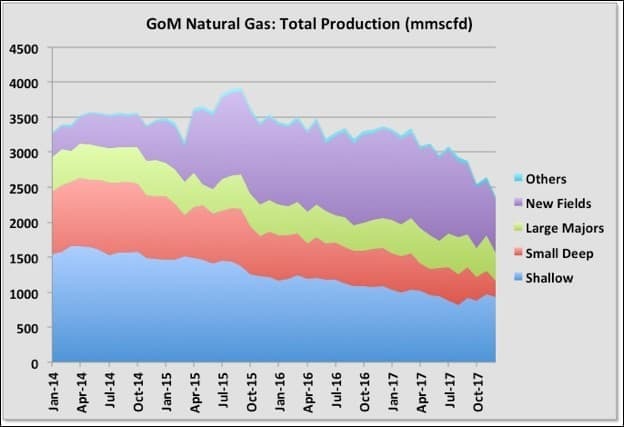 Natural gas production saw accelerated decline through 2017, mostly from rapid decline of Hadrian South and the Enchilada outage. Shallow fields added some production late in the year, all from one lease in the Eugene Island area. 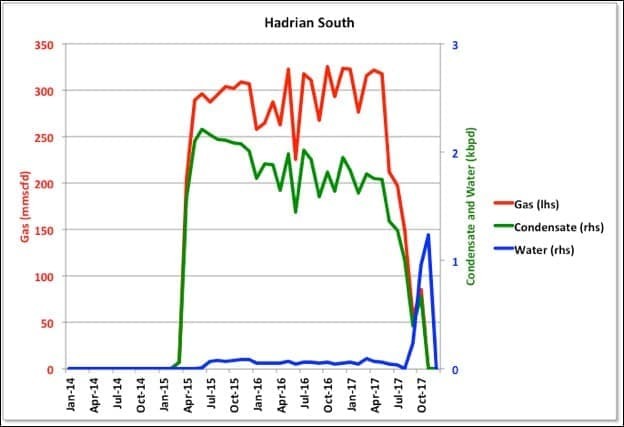 Apart from Hadrian South most of the gas from new fields is associated with the oil production and will decline in line with that. Otis is a small gas field that has been held offline by the Delta House outage. 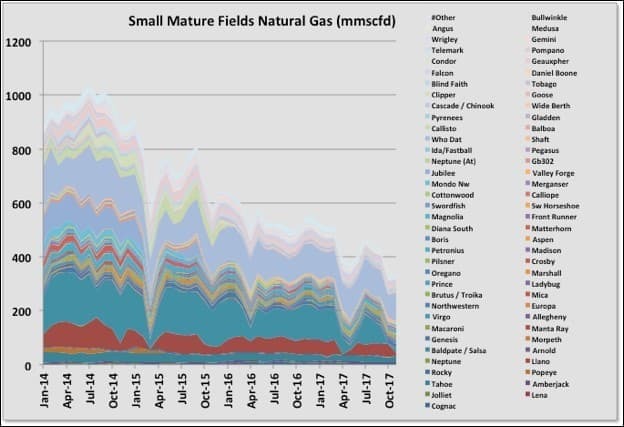 The impact from the loss of Baldpate / Salsa production, which are mostly gas producers, is shown here, however also evident is how fast those fields had been declining anyway since 2014. Hadrian South looks to have finished. 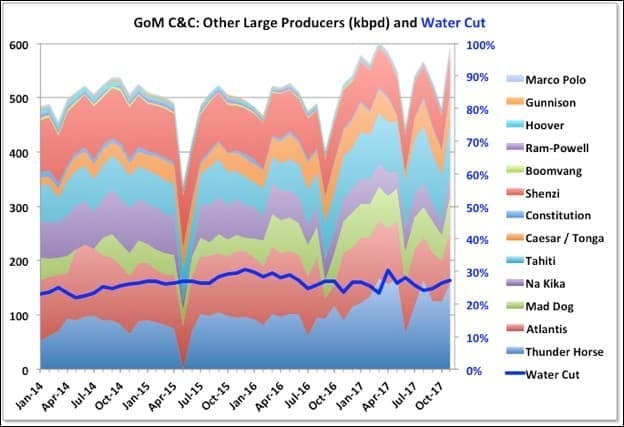 Production had been dropping fast since the summer and then, in October and November, water production appeared, and gas flow stopped. On plateau it produced 300 mmscfd from only two wells, which is pretty prolific and slightly higher than planned. The wells had been producing about equally, but one died between May and July and the second in November. Both were offline throughout December. Overall the field’s total recovery is lower than the BOEM reserve estimate, but only by about 38 bcf (6.5 mmbbls) so it’s questionable whether there will be any further efforts at increased recovery, certainly in the near future as there is no drilling rig contracted there, although there is another qualified lease for the field that has not yet been produced. 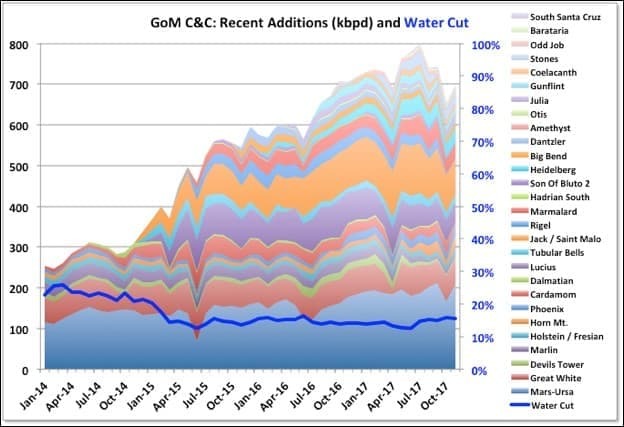 The following two charts show the number of producing wells for new fields and the larger, mature platforms. 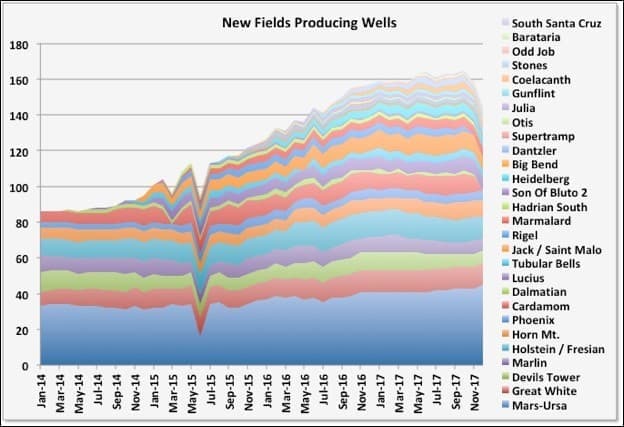 They both show how wells were added from 2014 through 2016, leading to the increased production in these two groups, but both numbers have now flattened off, which is likely to precede the start of a decline. For the new additions the move to tie-backs with one or two wells in 2016 and 2017 is evident and the continuous development at Mars-Ursa also stands out. 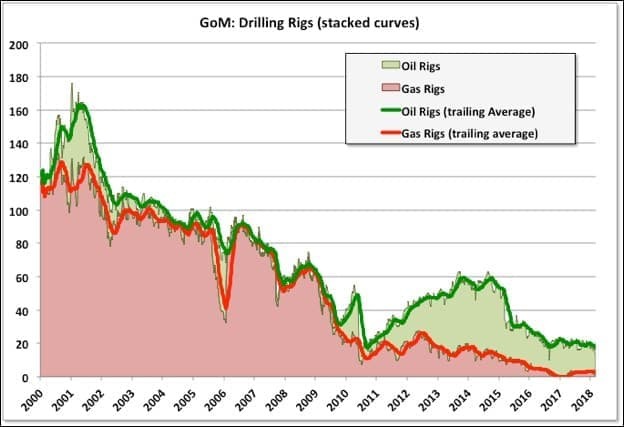 By Baker-Hughes active drill rigs averaged 20 in 2017 compared to almost 23 in 2016, and the numbers have continued to drop this year with a low of 13 earlier in March (the lowest since 2000, though the drop in shallow gas drilling is responsible for, by far, most of the change). The Stampede platform started up in January. It has nameplate of 80 kbpd but some of that is for potential future tie-backs. The wells are pre-drilled, and it should reach 50 or 60 kbpd stream day production quickly, though maybe not with high availability initially. LLOG plan to bring several fields on line with one to three well tie-backs to existing platforms. However Red Zinger and La Femme / Blue Wing Olive go to Delta House. The subsea system is likely to be fixed when these are due, but the Platform was operating at nameplate capacity and with extended production deferral may not have processing capacity for these new wells this year. Anadarko has planned five wells in existing fields, in particular for Constellation with BP, which will be about 15 kbpd. Anadarko have stated that they are looking at redeploying spar platforms onto other fields (probably for Shenandoah). I think that means one or more of their developments are nearing end of life, despite recent near field tie-backs, and that their remaining green field prospects are not very attractive at current oil prices. The platform mentioned was Marlin, though they have other mature Spar facilities like Holstein, which may impact LLOG as their tie-backs for Crown & Anchor are due to go there (but may have relatively short lives) and also is the site for two of this year’s new wells so maybe this is just conceptual speculation at the moment. Big Foot is due at the end of the year. It was originally planned for 2015 start-up but had mechanical failures during installation, which are now fixed. Capacity is 75 kbpd nameplate. It is heavy oil and uses dry trees with ESPs. 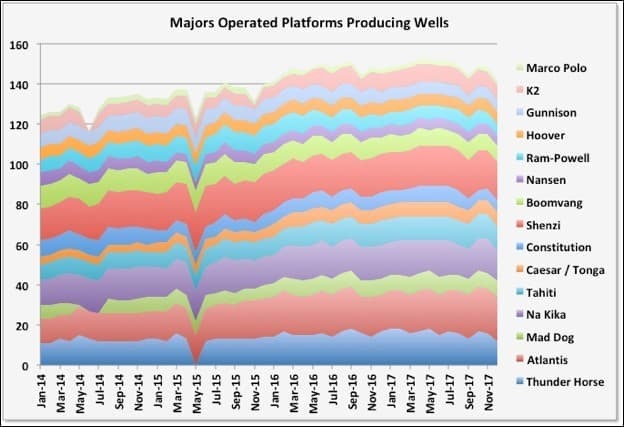 Two wells are pre-drilled, but the rest only have the top two conductor sections ready, therefore ramp-up will be through 2019 as new wells get completed.